Give each child a drinking straw, various colors of construction paper, glue, tape, a 9-inch piece of yarn, scissors, and crayons or markers. Bring a hole punch (or several, if you have a large group). Copy the Parrot pattern for each child. This pattern is a download you can purchase for just $1.99. Then print as many patterns with instructions as you need. Make sure names are on the parrots after they are completed. 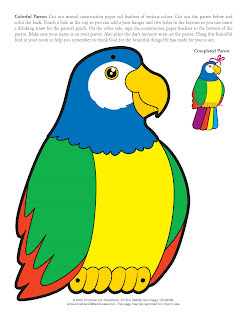 Let each child add a memory verse sticker to the craft or print the memory verse on the parrot as a reminder of the Bible story or lesson theme. As the children work, talk about ways they can tell others about Jesus this week. Say the memory verse together a few times. Click on the image above to download the Parrot Pattern and craft instructions.